As some of you are aware, my family and I enjoy vacations at Walt Disney World on a yearly basis. In fact, we are Disney Vacation Club (DVC) members for over 10 years now and it was probably one of the best things we ever did. Alas, this is not a sales pitch for the DVC (but if you do call, Jeff Fry – Northampton, PA referred you :), but more of me wanting to share some of my tips and tricks that we have learned over the years. Due to our location we always usually fly to Disney. Our local airport is a small regional airport that is very easy to get in and out of, and to be honest, it is one of those that you can show up 30-45 minutes before your flight and still make it – with luggage. I prefer to find a direct flight as much as possible, these flights tend to be easier on the kids – as well as parents – since the stress of delays, connections, etc is greatly reduced. Another benefit of staying on-site and flying is a thing Disney offers called Magical Express. This is a complimentary transportation service that is offered to Disney guests who are flying into Orlando (MCO). Disney will pick you up at the airport (ok, you take a free bus) and take you to your hotel, as well as that you do not need to worry about your luggage. They will deliver it to your room a few hours after you arrive -no need for you to wait at the luggage carousel. This is a great service that we love to use whenever we can! If you do plan to drive (we have done it before we had kids), be prepared for a drive. A GPS is your friend during this trip – plan your breaks accordingly and also allow for some unforeseen difficulties. Flat tires happen, traffic happens, ticket can be prevented – but we are all sometimes guilty of exceeding the speed limit from time to time. Another alternative, and a more common one, is to use your smart phone and a GPS application. If you choose to do that, I suggest you look at Waze. It uses “social driving” to know what is going on as it monitors other Waze users with regards to their speeds and also accepts reports from Waze users about disabled vehicles, police, accidents, and other hazards. If you are going to consider driving, an option you may want to consider is renting a car. Why? Well, if it breaks down or, god forbid, you have an accident – a rental company will typically replace the car and get you on your way. If it was your car, you would have to arrange the repair – find a local station – etc and all that will add stress and time to your trip. Call the cost of the rental your insurance policy for a good vacation. When it comes to staying at Disney, for us there is no other option but on-site hotels. The convenience factor far outweighs anything else in our decisions, at least that is how we feel. We have stayed at Caribbean Beach, Port Orleans Riverside, Wilderness Lodge, Saratoga Springs, Old Key West, as well as Disney All Star Movies. Out of that list we LOVE Old Key West the most as it was the first Disney Time share location built – historical note- this used to be called Disney’s Vacation Club Resort until January 1996 – and being the first it was larger then all the ones that came after it. The layout for a typical 2-bedroom is about 1,333 square feet and is a magical place to stay. The rooms are large, the beds are comfy, and was just recently updated with flat-screen TVs and such. 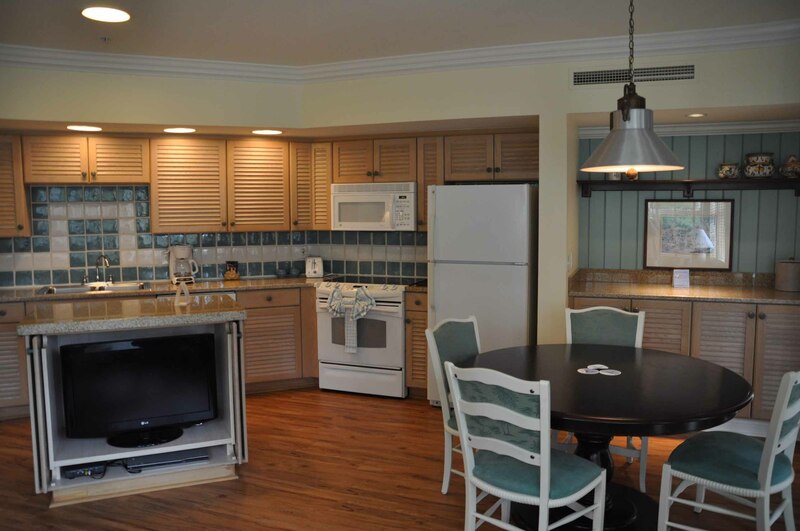 Also worthy of noting that all DVC rooms have either a full kitchen in them or, in the case of the Studio room, a kitchenette. This allows you to food shop during your stay and prepare a few meals and save some money. Our second favorite would be the Villas at Disney’s Wilderness Lodge as the atmosphere here is wonderful. You feel so far removed from things you begin to feel like you are in the woods! This is a beautiful place to say, but does tend to be very difficult to get a DVC villa at due to popularity and size. 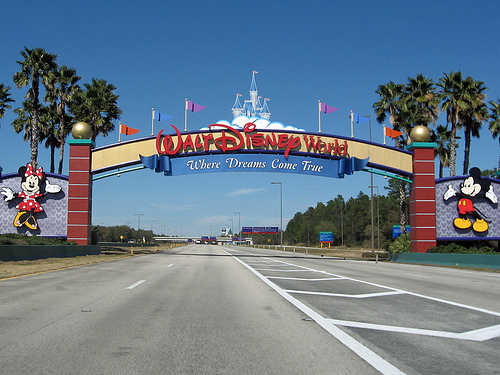 One great feature about this hotel is the proximity to Walt Disney World. You can just hop a quick boat ride over to the park! Saratoga Springs is probably one of the largest Disney Vacation Club resorts, largest in the sheer scope of the location is HUGE! Even though it is large, it is a great place to stay! Being one of the newest resorts built, it is up to date with features and amenities, has an awesome pool with a really cool slide, and a nice eating area, and the best feature is that the SPA is on-site here. There have been a few times where I have purchased package for my wife and just let he go get pampered for a day. Ok, enough about all the DVC type hotels – really don’t want to make this sound like “Why I love DVC” post. We LOVE the Caribbean Beach resort so much, we have even stayed there with our points in the past instead of one of the DVC Villas. The rooms are nice, the atmosphere is amazing – colors, walkways, beach, etc – it is a very nice hotel to stay at. The food court is great – plenty of variety and there is also a really nice restaurant you can eat at. If you have an option of every staying here, you wont’ be disappointed. A quick word on the All Star hotels – ie the Value resorts. They are nice if you just need a room – but not much else. There is no bell service, the rooms are on the lower end, and they are usually placed in out-of-the-way locations. They are not as bad as some places, but when we are on vacation we want some pampering – and the Golf Cart ride we get at DVC and the moderate resorts are just cool! 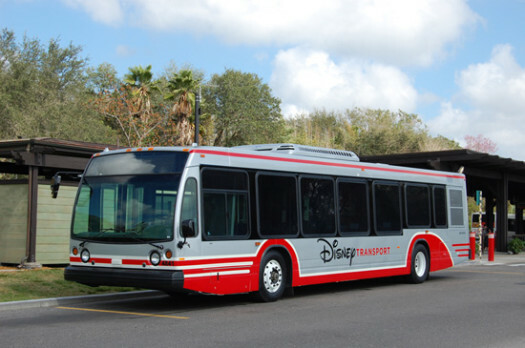 If you are staying on-site in Disney, you have the option of using the in-park Disney Transportation system to get from your hotel to any park. This is a free service and is very convenient and easy to use. You just go to the bus stop, wait for your bus, hop on and they take you to the park. The only problem that we have with it is the time between buses – it may be up to and over 30 minutes between a bus for the park you are going to. The other problem is at night – if you are heading back when the parks are closing, there is a good chance the buses will be full and it will be standing room only. Granted, most bus rides are only about 10-15 minutes – but with kids that is an eternity. So as you might have guessed, we do the Car Rental thing. Renting a car while staying at an in-park hotel is really nice and convenient. You get free parking at all the parks (nice perk for staying on-property) as well as can come and go as you please. Many times we have gone to Epcot, parked the car there and then hopped the Monorail over to Magic Kingdom for the morning. If you want to run out and get a bite to eat – say at a Pizzeria – you can just leave and go. You are not locked into the Disney experience as much, but the freedom it gives you is so worth it. There is one other option for getting to and from the airport and hotel, that’s Car Service. There are quite a few services down there, but the one we have used many times in the past is Tiffany’s Town Car. They have been reliable and very courteous to us over the years. Their service also includes a 30 minute shopping stop, so if you need to get anything when you get there (diapers, food, etc), you can have them stop at a store so you can pick it up. 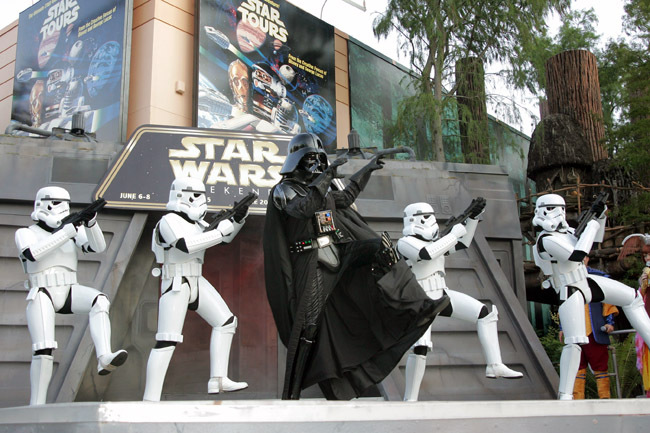 Tickets are an interesting topic when it comes to Disney. I actually tend to recommend to people that ask me about them to look at season passes and then try to do a Disney vacation in back to back years. The thought here is, and this is what we do, the season passes are good for 12 months after purchase. 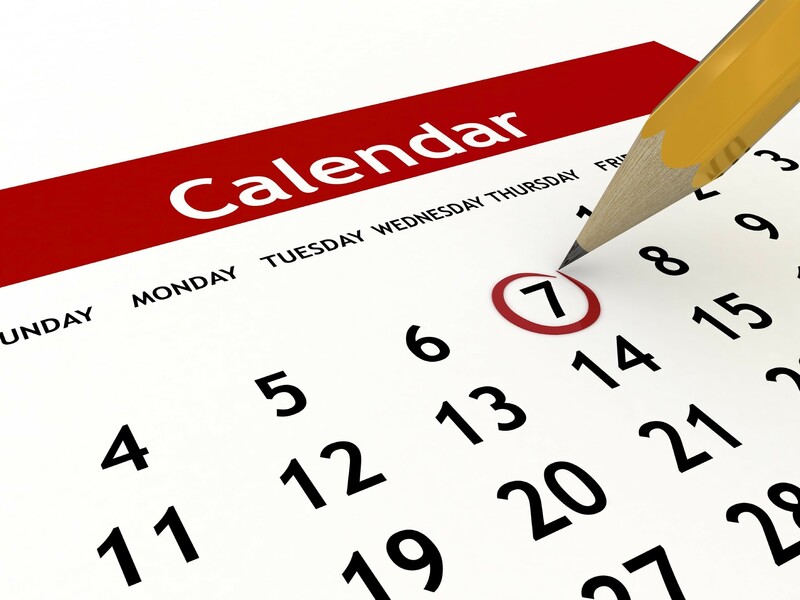 If you go on vacation in December and purchase a season pass, then go the following October – you can use that same season pass. Basically you are able to get two years of vacation tickets for the price of one. 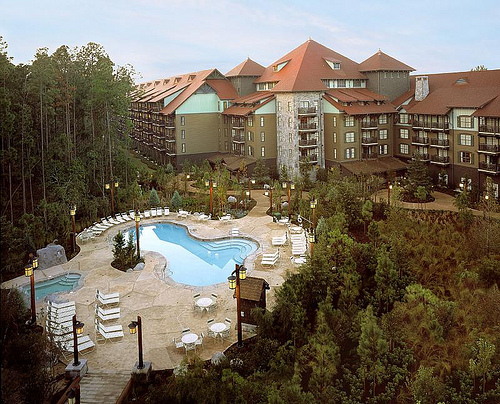 Another perk to Season Passes is that Disney will send you offers from time to time for discounted Hotel rooms and activities – we have stayed at the Value Resorts for as little as $59/night because of offers we received. Now bear in mind that Season Passes are not cheap, $609 each last I looked (12/13) – link – but when you look at a day ticket was about $90, so if you are going to be there for 5 or 6 days, it is actually cheaper as Season passes also allow park-hoping and shopping discounts.. The season pass also lets you Park Hop by default, so no need to have that option added. Recently Disney introduced Magic Bands and this trip (11/13) was our first experience with them. I have to say, we where hesitant about them at first, but quickly came to love them. They are your park ticket, door key, pay medium, FastPass + ticket, and a few other things I am sure. 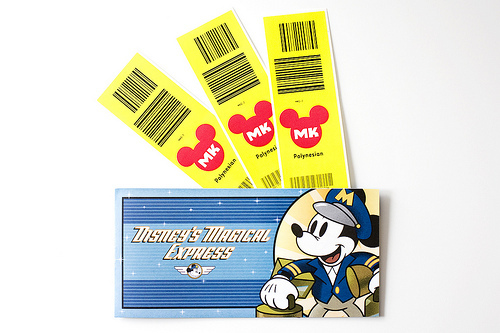 For the park ticket, we logged into My Disney Experience ( link ) and linked our Season Passes to the bands, was quick and simple – no more keeping track of the passes while we are there. This really worked out good with the kids – no more worrying about where their passes are after they enter the park! The Magic Band is also your key to your room, just use the place the Mickey by the lock and the door unlocks – so much easier than having to find your key card and open the door – especially with a sleeping kid in your arms! With the FastPass + portion, you can actually “schedule” some Fast Passes for your trip ahead of time and they will be synced to your Magic Band. You can do this from your My Disney Experience portal and then manage all of that via the Smartphone app ( itunes andriod). Ok, now for the one that you are probably concerned about – payments. Well, it kinda works the same way a debit card does – with a pin. You can sync a Credit Card to your Magic Band (just like you can with your room key in the olden days), but the difference here is that you use a PIN to authorize the purchase versus having to sign a slip. I use the band a few times for this, and it was nice and easy. The wife and I kept the PIN to ourselves so that we are the only ones who could use it. I am not going to spend too much time on the parks, most of us already know of Magic Kingdom, EPCOT, Disney Hollywood Studios, and Animal Kingdom already. What is will say is that if you stay on-property, the park thing becomes much different. What we tend to do is one park in the morning, go back to the room for a rest and a nap, then another park in the evening. They are all quick drives to and from and it makes the stay much nicer. When it comes to shopping, Downtown Disney is the place to find almost everything! There are some things that are Park-only, but most of everything else is here, and if you have a Disney Visa, you can expect to save about 10% (I think) when you use the card. There are also plenty of outlets nearby to Downtown Disney as well as a WalMart and some food stores. You do not need to go far in order to get what you need, I think we drive – at most – 10 minutes either way of the park to get stuff. Ahh, food – wonderful subject! There are tons of restaurants on Disney property as well as outside of Disney. There is a pizza place just outside Downtown Disney called Flippers Pizzeria that we get at least once or twice during our stay. The price and food is wonderful, and it is only 2 minutes from Downtown Disney. 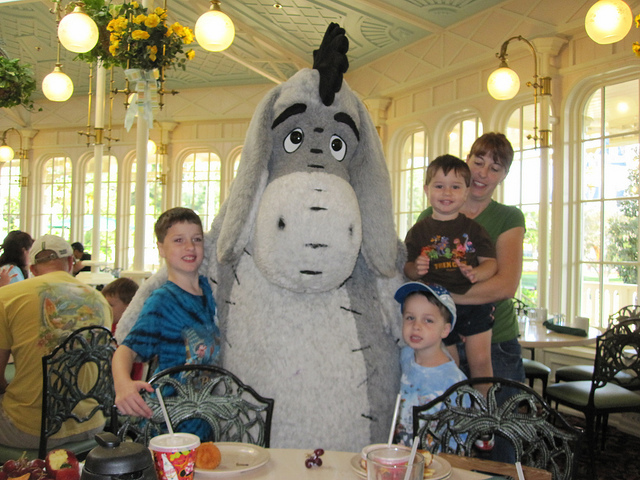 Character Meals are probably one of the best food experiences you can have at Disney, and we have done many of them. I will quickly highlight a few that we do quite often and the meal associated with it. This is a wonderful place to have breakfast early in the morning. You can get in the park before all the regular guests do and walk down Main Street USA with almost nobody there. It is a great chance to get pictures of the Castle with nobody in the way, just you and the Castle is all you will see. The breakfast is served Buffet style and has a great variety of food – all good too! Characters include Pooh, Tigger, Eeyore, and Piglet. They make their rounds and the kids love it! 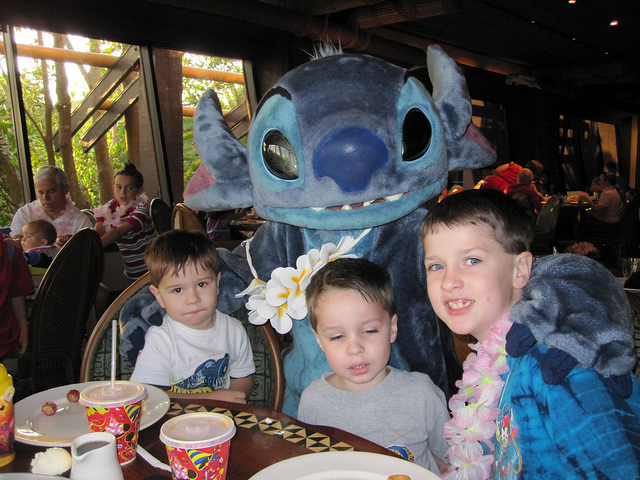 Another wonderful place for breakfast is at the Polynesian at ‘Ohana. The coffee is Kona (good coffee!) and the food is served family style (be sure to try the Pineapple bread, to die for!). The characters are Lilo and Stich – but if I recall a few others might make their presence as well. Another neat trick about eating breakfast here is that you can leave your car here all day. So after breakfast, just jump on the Monorail over to Magic Kingdom and enjoy yourself. This is a nice, quiet breakfast location. It is not that well know compared to the others, so you get to relax a bit more. Again, this is another buffet style – but the Jungle juice served with breakfast is wonderful . Characters here include Donald Duck, Daisy, Goofy, and Mickey Mouse. This was probably our most favorite place to have dinner with the family and Characters, the food has changed over time and is not as kid friendly. You get Chip, Dale (red nose), Minnie, and Mickey for your characters. They rotating feature of the restaurant is neat as it allows you to see the scenery from the boat ride below. The food is served family style here, and the kids usually get their own choosing. 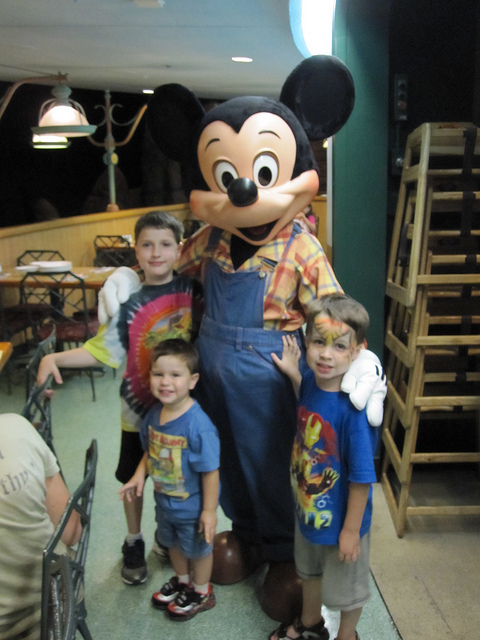 We have done Chef Mickey’s from time to time, not as often as the others I have mentioned thought. This is another buffet style meal for the whole family, they do have a great desert bar though! This one seems to be the most popular of all of them, and hence the most crowded. It is a good time, so if you can get it – go for it! Planning the trip is probably the hardest thing to do – it takes time and is very difficult to keep everything in together. What we found a few years back is a book called PassPorter’s Walt Disney World 2011: The Unique Travel Guide, Planner, Organizer, Journal, and Keepsake! and was created by PassPorter.com. That book has been with us every year (in refresh) for the past few years. It has folders to hold everything, checklists, and planning materials that we have found to be invaluable. If you are going to Disney for vacation, this is one book you need to have! it will make your life so much easier as you will be better organized! Another good book for information is Birnbaum’s Walt Disney World 2011. This book tends to have some great information on the parks, new rides and updates, as well as some good general information. If you already have a copy, you do not really need to get a new one every year – but sometimes when the parks are making changes it is nice to pick up a refresher copy. It is only a few dollars, and if need be, can be used to keep the kids quiet during a plane ride as there are plenty of pictures to look at. This is a personal question and will all ultimately depend on your life’s schedules. We tend to travel down to Disney either late September/early October or right after Thanksgiving as it is usually less crowded. We actually prefer the December time frame because of the ability to do some Christmas shopping there and the parks are all decorated for Christmas. The weather is cooler (80’s), the crowds are smaller, and it just seems to be a good time to go. Under the When to go part I am going to add what seasonal activities happen at Walt Disney World. There are holiday parties, food events, and other things that go on that might help you decide on when you go. A few other things to consider when you are going. If you are going down when there is a potential for rain, it is cheaper to get ponchos before you go and have them ready. $2 item at home is a $10 item at the park – granted, it does have a mouse on the back of it. If your kids are afraid of the self-flushing toilets, bring small post-it notes to cover the sensors. Pick up quick and easy snacks that do’t melt – Goldfish and pop-tarts come to mind. Also, if you are traveling with children – SafetyTat is a great product! It is a temporary tattoo you can put on your children that has your emergency contact information on it. We have used these for years now, and luckily never had to rely on them. But, god forbid, they wander off they do not need to worry about how to contact mommy or daddy, just show the tattoo and our number is there.